Benefit of Being An Immediate Relative. Step Two – After you receive Form I-797, Notice of Action, showing that the Form I-130 has either been received by United States Citizenship and Immigration Services or approved, then you may file Form I-485. When you file your I-485 application package, you must include a copy of the Form I-130 receipt or approval notice (the Form I-797). USCIS works with the Department of State to issue a visa on an approved Form I-130 petition when a visa is available. You may then travel on the visa and will officially become a permanent resident when admitted at a U.S. port of entry. Turning 21 years of age. When an immediate relative child of a U.S. citizen reaches the 21 years of age, he or she generally will become a “first preference” (F1) category son or daughter (over 21 years of age) of a U.S. citizen, and will no longer have a visa immediately available. This change may result in a significant delay in adjustment of status or visa processing because he or she will now need to wait for an immigrant visa to become available. In certain cases, the Child Status Protection Act (CSPA) may allow you to retain the classification of “child” even if you have reached age 21. Generally, your age is “frozen” as of the date your U.S. citizen parent files Form I-130 for you. If the petition (Form I-130, Petition for Alien Relative) was filed by a U.S. citizen parent for his or her child, the beneficiary’s age “freezes” on the date of filing. The child must then “seek to acquire” permanent residence within 1 year of a visa becoming available. If an immediate relative child under age 21 gets married, he or she can no longer be classified as an “immediate relative” and will become a “third preference” (F3) category married son or daughter of a U.S. citizen and a visa would no longer be immediately available. You must notify USCIS of any change in your marital status after Form I-130 has been filed for you and prior to becoming a permanent resident or obtaining an immigrant visa. If you are currently in the United States and are one of the specified categories of relatives of a U.S. citizen in a preference category, you may be able to become a permanent resident in two steps. Step One – Your U.S. citizen family member (sponsor) must file the Form I-130, Petition for Alien Relative, for you and it must be approved. You must wait for your priority date in your immigrant visa category to become current. Your priority date is the date when the Form I-130 is properly filed (with correct fee and signature) on your behalf by your U.S. citizen relative. Step Two – Once the priority date in your visa category is current, you may file for Adjustment of Status with Form I-485, Application to Register Permanent Residence or Adjust Status. 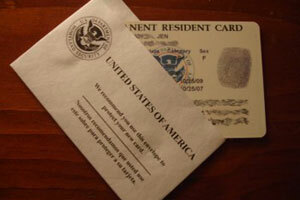 Adjustment of Status is the process you go through to become a Permanent Resident. If you are currently outside the United States and are one of the specified categories of relatives of a U.S. citizen in a preference category, you can become a permanent resident through consular processing. USCIS works with the U.S. Department of State to issue a visa on an approved Form I-130 petition when a visa is available. In this process the Department of State will issue you a visa. If approved, you may then travel on the visa and will officially become a permanent resident when admitted at a U.S. port of entry. The Child Status Protection Act (CSPA). In certain cases, the CSPA may allow you to retain the classification of “child” even if you have reached age 21. Generally, your age is “frozen” as of the date your U.S. citizen parent files Form I-130 for you. If the petition (Form I-130, Petition for Alien Relative) was filed by a U.S. citizen parent for his or her child, the beneficiary’s age “freezes” on the date of filing. The child must then “seek to acquire” permanent residence within 1 year of a visa becoming available. If you are the unmarried son or daughter of a U.S. citizen and you get married prior to becoming a permanent resident, then you no longer qualify as an “Unmarried Son or Daughter of a U.S. Citizen” and will convert to the category of “Married Son or Daughter of a U.S. Citizen.” This change in categories may result in a significant delay in your immigrant visa becoming available. You must notify USCIS of any change in your marital status after Form I-130 has been filed for you and prior to becoming a permanent resident or obtaining an immigrant visa. Permanent Residents ( Green Card Holders) that petition for their relatives. Immigration law allows permanent residents of the United States (green card holders) to petition for certain eligible relatives to come and live permanently in the United States. A permanent resident may petition for his/her spouse and unmarried child(ren) of any age to immigrate to the United States. Congress has limited the number of relatives who may immigrate under these categories each year so there is generally a waiting period before an immigrant visa number becomes available. Steps required to get a green card for relatives of a permanent resident (in a Family 2nd Preference category). If you are currently in the United States and are one of the specified categories of relatives of a permanent resident, you may be able to become a permanent resident in two steps. Step One – Your permanent resident relative must file Form I-130, Petition for Alien Relative, for you and it must be approved. You must wait for your priority date in your immigrant visa category to become current. Your priority date is the date when the Form I-130 is properly filed (with correct fee and signature) on your behalf by your U.S. permanent resident relative. If you are currently outside the United States and are one of the specified eligible categories of relatives of a permanent resident, you can become a permanent resident through consular processing. USCIS works with the U.S. Department of State to issue a visa on an approved Form I-130 petition when a visa is available. In this process the Department of State will issue you a visa. If approved, you may then travel on the visa and will officially become a permanent resident when admitted at a U.S. port of entry. If you are an unmarried child of a permanent resident, turning 21 years of age may delay the process of becoming a permanent resident or obtaining an immigrant visa. You will no longer qualify as an “Unmarried Child of a Lawful Permanent Resident” (F2A) and will convert to the category of an “Unmarried Son or Daughter of a Lawful Permanent Resident (F2B).” This change in categories may result in a significant delay in your immigrant visa becoming available. The Child Status Protection Act (CSPA). In certain cases, the CSPA may allow you to retain the classification of “child” even if you have reached age 21. If the petition (Form I-130) was filed by a permanent resident parent and the parent naturalizes before the beneficiary turns 21, the beneficiary’s age “freezes” on the date the petitioner naturalized. The child must “seek to acquire” permanent residence within 1 year of a visa becoming available. If you are the unmarried son or daughter of a permanent resident, and you get married prior to becoming a permanent resident, you no longer qualify for permanent residence through your permanent resident family member. There is no visa category for a married child of a permanent resident. Note: You must notify USCIS of any change in your marital status after Form I-130 has been filed for you and prior to becoming a permanent resident or obtaining an immigrant visa. Permanent Resident Relative Becomes a U.S. citizen. If the permanent resident relative that petitioned for you becomes a U.S. Citizen, your preference category would change and a visa may be available sooner. This is because you would now be getting a green card as a relative of a U.S. citizen.